Acne is a common skin disease that affects up to 80% of people in their lifetime. It is most common among teenagers, but it can affect adults of all ages. Because of coconut oil’s many health properties, some people have started using it to treat acne. This involves applying coconut oil directly to the skin, as well as eating it. However, while coconut oil has been studied for various health benefits, very little research has examined its ability to fight acne. Acne forms when oil and dead skin cells clog up pores. Pores are little holes in the skin, often referred to as hair follicles. Each hair follicle is connected to a sebaceous gland, which produces an oily substance called sebum. When too much sebum is produced, it can fill and plug the hair follicle. This causes bacteria known as Propionibacterium acnes, or P. acnes, to grow. The bacteria get trapped in the follicle, which causes your white blood cells to attack it. This results in skin inflammation, which leads to acne. Symptoms of acne include whiteheads, blackheads and pimples. Some cases are more severe than others. Many factors contribute to the development of acne, including hormone changes, genetics, diet, stress and infection. Summary: Acne starts when oil and dead skin cells clog up skin pores, causing inflammation. Many factors contribute to this condition. Coconut oil consists almost entirely of medium-chain fatty acids (MCFAs). MCFAs have strong antimicrobial effects, which means they can kill disease-causing microorganisms. Almost 50% of the fatty acids found in coconut oil are the medium-chain lauric acid. Lauric acid may help kill harmful bacteria, fungi and viruses in the body. On its own, lauric acid has been shown to kill P. acnes (1, 2). In one study, lauric acid was more effective at killing these bacteria than benzoyl peroxide — a popular acne treatment. It also showed therapeutic potential against inflammation caused by the bacteria (3). In another study, lauric acid was combined with retinoic acid. Together, they inhibited the growth of the acne-causing skin bacteria (4). Coconut oil also contains capric, caproic and caprylic medium-chain fatty acids. While not as powerful as lauric acid, some of these are also effective against the bacteria that cause acne (5). This property only applies when applying coconut oil directly to the skin, as this is where the acne-causing bacteria are located. Summary: Coconut oil is high in medium-chain fatty acids that have been shown to kill the acne-causing bacteria called Propionibacterium acnes. Many people with acne suffer from skin damage, which can lead to scarring. Moisturizing the skin is an important step in keeping it healthy. That’s because your skin needs adequate moisture to fight infection and heal properly. Research shows that applying coconut oil to the skin can help relieve dry skin while fighting bacteria (6). In fact, studies show that using coconut oil as a moisturizer is as effective or more effective than using mineral oil (7, 8). Additionally, coconut oil may help heal your skin and prevent it from scarring. 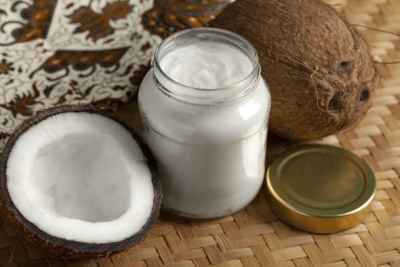 In one study, rats with wounds treated with coconut oil experienced less inflammation and increased production of collagen, a major skin component (9). As a result, their wounds healed much faster. Keeping your skin moisturized may reduce the risk of developing acne scars (10). Summary: Coconut oil effectively moisturizes the skin. It may also help heal skin damage and reduce scarring. 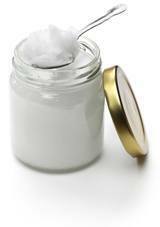 The fatty acids in coconut oil may also fight acne-induced inflammation. Multiple test-tube and animal studies have demonstrated the antioxidant and anti-inflammatory properties of coconut oil (11, 12, 13). These findings suggest that eating coconut oil may help reduce the redness and swelling of inflammatory acne. However, this effect needs to be confirmed in human studies. Summary: Eating coconut oil may help reduce the inflammation associated with acne, but more research is needed. Eating coconut oil isn’t problematic for most people. However, some people apply it directly to the skin as a facial cleanser or moisturizer. This may be beneficial against acne, but it’s not recommended for people who have very oily skin. Coconut oil is highly comedogenic, which means it can clog pores. Consequently, it may actually make acne worse for some people. Summary: When applied to the skin, coconut oil may clog pores and make acne worse. It is not recommended for those with very oily skin. Coconut oil is high in lauric acid, which helps kill the bacteria that cause acne. Applying coconut oil to the skin can kill acne-causing bacteria and increase moisture, which may also reduce acne scarring. However, coconut oil may be problematic for people with very oily skin. To avoid making the problem worse, you may want to check with a dermatologist before trying it out. However, eating coconut oil is safe. The studies showing health benefits used two tablespoons (30 ml) per day. If you want to try it, organic, virgin coconut oil is the best kind.